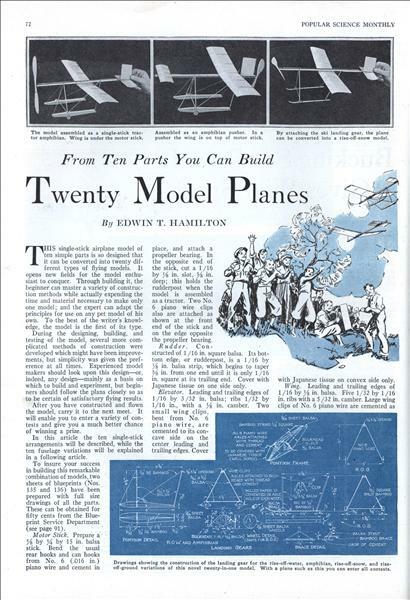 By EDWIN T. HAMILTON THIS single-stick airplane model of ten simple parts is so designed that it can be converted into twenty different types of flying models. It opens new fields for the model enthusiast to conquer. Through building it, the beginner can master a variety of construction methods while actually expending the time and material necessary to make only one model; and the expert can adapt the principles for use on any pet model of his own. To the best of the writer's knowledge, the model is the first of its type. HOW NEON LIGHTS ARE MADE. 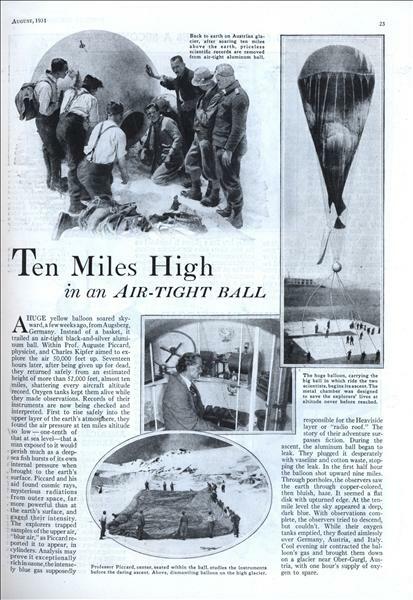 The story of the strange new light, invented by Georges Claude, French engineer, told in photos. FIRST STEP IN MAKING A NEON SIGN. An artist draws a design which includes lettering and decoration, and this design is then enlarged to desired size so tubes can be right dimensions. 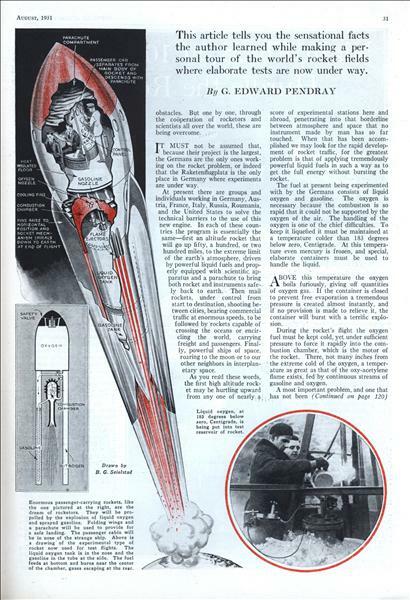 SHAPING THE HOT TUBES. 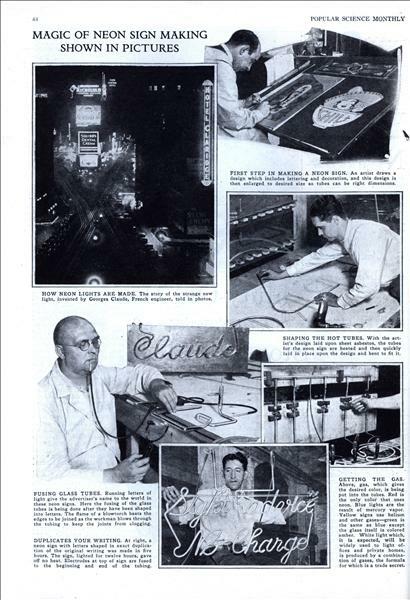 With the artist's design laid upon sheet asbestos, the tubes for the neon sign are heated and then quickly laid in place upon the design and bent to fit it. TWO expeditions, one German, one British, established outposts upon the forbidding ice cap of central Greenland, last year, seeking a possible landing place for transatlantic airplanes. 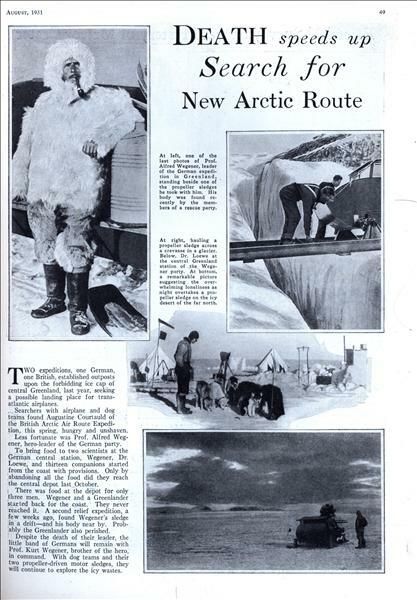 Searchers with airplane and dog teams found Augustine Courtauld of the British Arctic Air Route Expedition, this spring, hungry and unshaven. 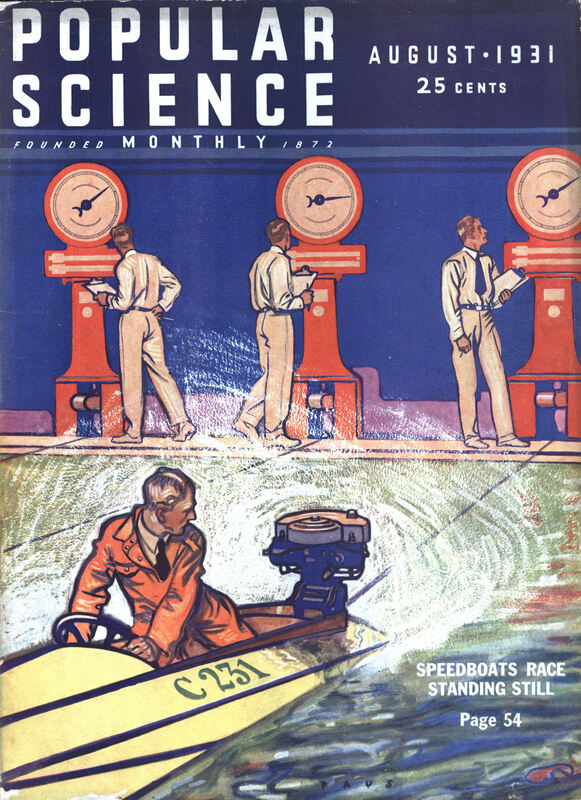 By EDWIN W. TEALE THIS Is the First of a Series of Articles on the New Use of Science in Trailing Crooks... 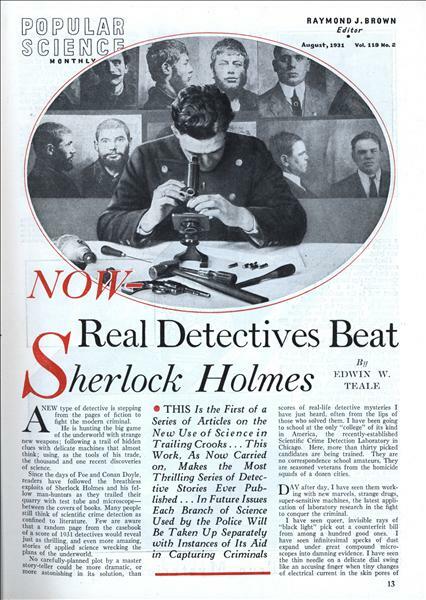 This Work, As Now Carried on, Makes the Most Thrilling Series of Detective Stories Ever Published... In Future Issues Each Branch of Science Used by the Police Will Be Taken Up Separately with Instances of Its Aid in Capturing Criminals NEW type of detective is stepping from the pages of fiction to fight the modern criminal. 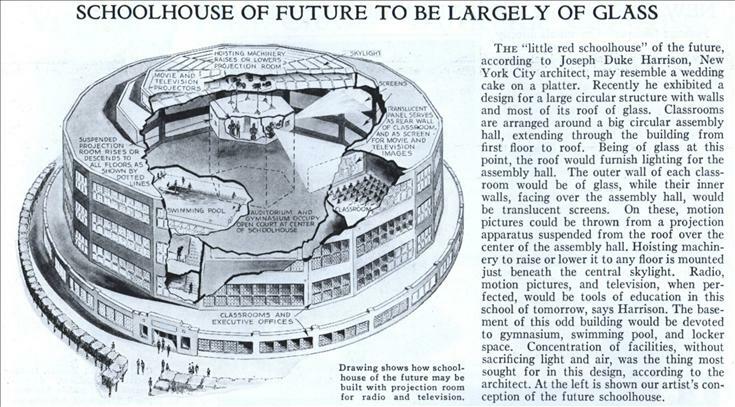 The "little reel schoolhouse" of the future, according to Joseph Duke Harrison, New York City architect, may resemble a wedding cake on a platter. 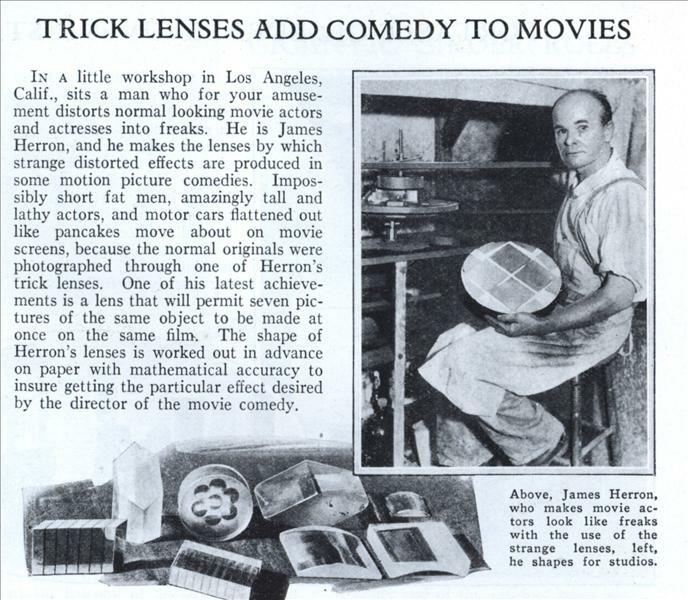 Recently he exhibited a design for a large circular structure with walls and most of its roof of glass. WORKING with a tiny needle and a wafer-thin piece of sheet metal, William A. Wallace, New York photographer, has taken an amazing series of pictures of New York skyscrapers. From street level to topmost floor, he has registered every detail on his film with his camera placed just across the street from these architectural giants. 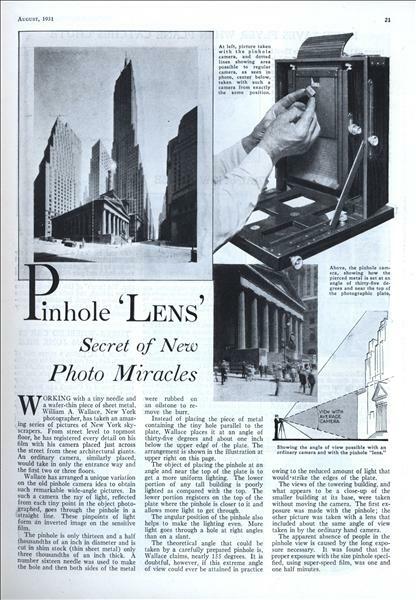 An ordinary camera, similarly placed, would take in only the entrance way and the first two or three floors. 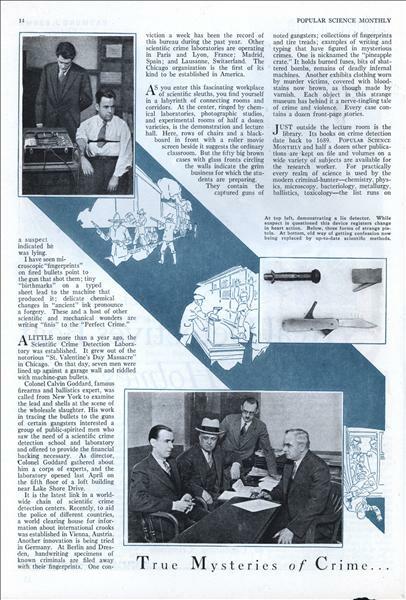 NEW apparatus, of almost human intelligence, aids in transmitting the Western Union Telegraph Company's time service to subscribers in all parts of the country. 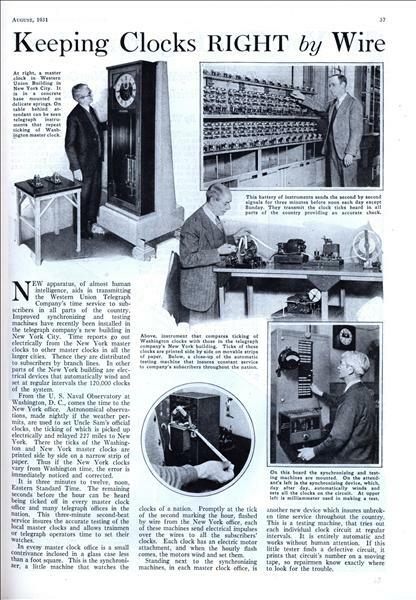 Improved synchronizing and testing machines have recently been installed in the telegraph company's new building in New York City. 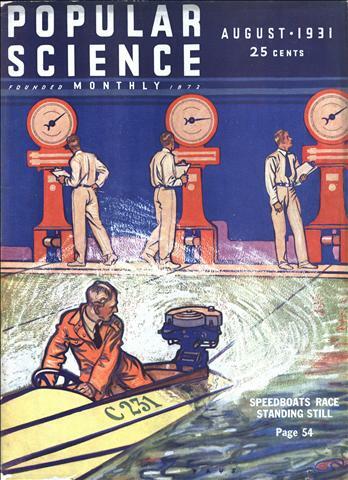 Time reports go out electrically from the New York master clocks to other master clocks in all the larger cities. 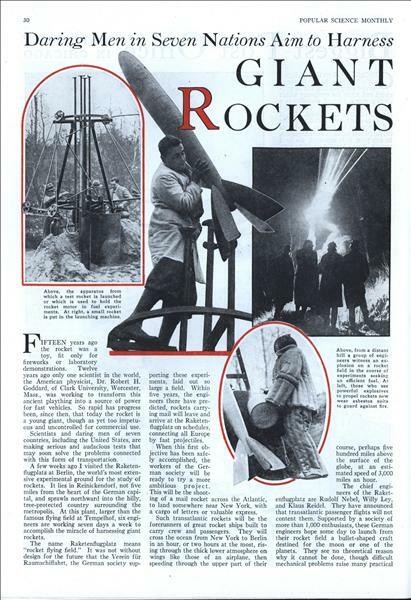 Thence they are distributed to subscribers by branch lines. In other parts of the New York building are electrical devices that automatically wind and set at regular intervals the 120.000 clocks of the system. 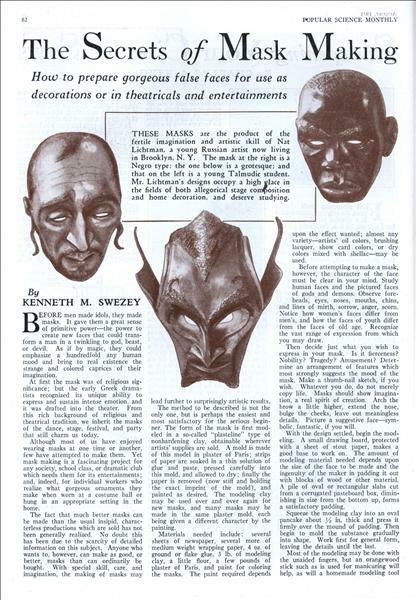 How to prepare gorgeous false faces for use as decorations or in theatricals and entertainments By KENNETH M. SWEZEY BEFORE men made idols, they made masks. It gave them a great sense 1 of primitive powerâ€”the power to create new faces that could transform a man in a twinkling to god, beast, or devil. As if by magic, they could emphasize a hundredfold any human mood and bring to real existence the strange and colored caprices of their imagination. Chicago Police, Trained to Handle Armed Men, Show, in Series of Pictures, How Weapons Can Be Wrested from Footpad WHAT TO DO AND HOW. 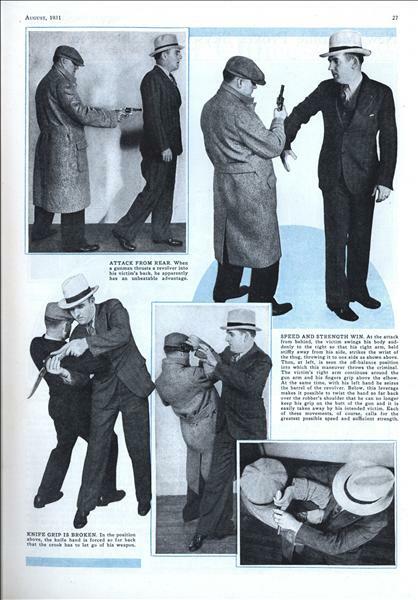 Photos on this and following page give a good idea of how officers are taught to disarm a thug even after he has them covered. 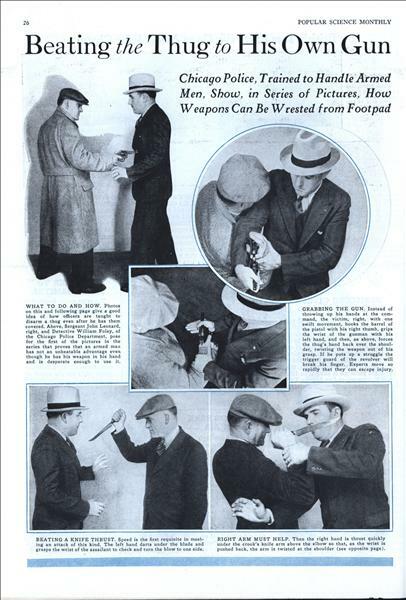 Above, Sergeant John Leonard, right, and Detective William Foley, of the Chicago Police Department, pose for the first of the pictures in the series that proves that an armed man has not an unbeatable advantage even though he has his weapon in his hand and is desperate enough to use it. Is It Possible to Learn the Truth About the Habits of Alleged Man-Eaters in the Semitropic Water? 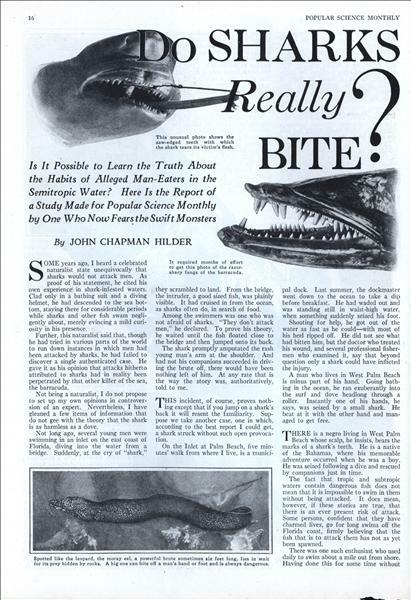 Here Is the Report of a Study Made for Popular Science Monthly by One Who Now Fears the Swift Monsters By JOHN CHAPMAN HILDER SOME years ago, I heard a celebrated naturalist state unequivocally that sharks would not attack men. As proof of his statement, he cited his own experience in shark-infested waters. 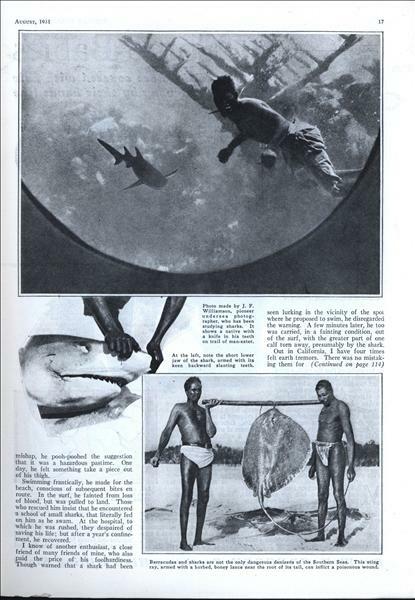 Clad only in a bathing suit and a diving helmet, he had descended to the sea bottom, staying there for considerable periods while sharks and other fish swam negligently about, merely evincing a mild curiosity in his presence. Further, this naturalist said that, though he had tried in various parts of the world to run down instances in which men had been attacked by sharks, he had failed to discover a single authenticated case. He gave it as his opinion that attacks hitherto attributed to sharks had in reality been perpetrated by that other killer of the sea, the barracuda. 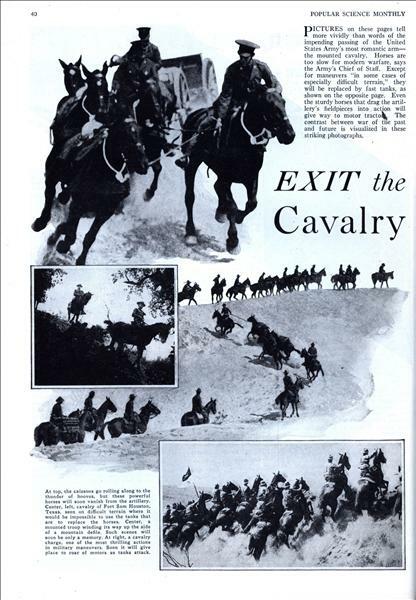 PICTURES on these pages tell more vividly than words of the impending passing of the United States Army's most romantic armâ€” the mounted cavalry. Horses are too slow for modern warfare, says the Army's Chief of Staff. 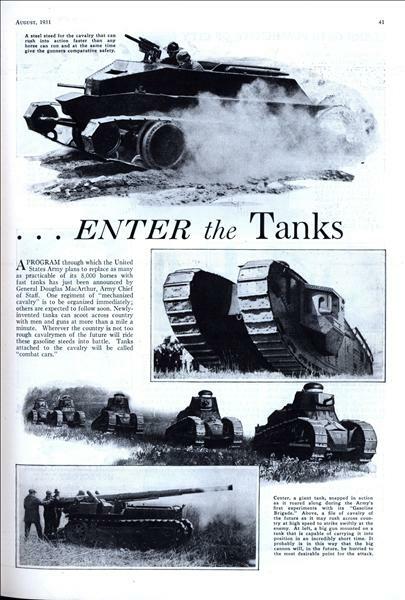 Except for maneuvers "in some cases of especially difficult terrain," they will be replaced by fast tanks, as shown on the opposite page. Even the sturdy horses that drag the artillery's fieldpieces into action will give way to motor tractor. The contrast between war of the past and future is visualized in these striking photographs. THE volume of a harmonica can be increased for playing in public, especially in large auditoriums or outdoors, by amplifying the sound with a medium-sized megaphone. A slot is cut in the megaphone about 3 in. 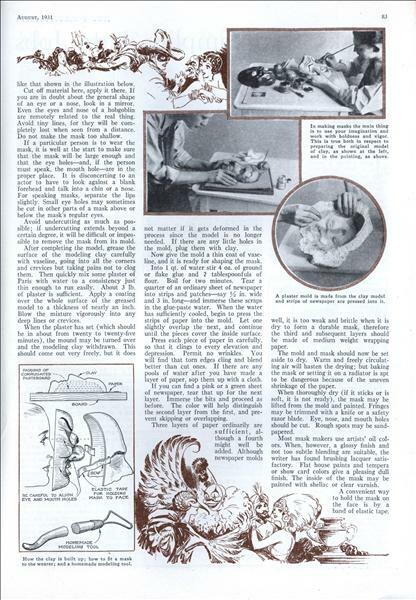 from the mouthpiece, and oyer this is riveted a metal holder made as illustrated below with two lips to grip the harmonica, which is of the "marine band" type. NEW KIND OF AUTO EYES MAKES NIGHT DRIVING Safer than Day! Fits Any Headlight. . . Ends Dangerous Dimming . . . Doubles Roadlight! AT LAST! 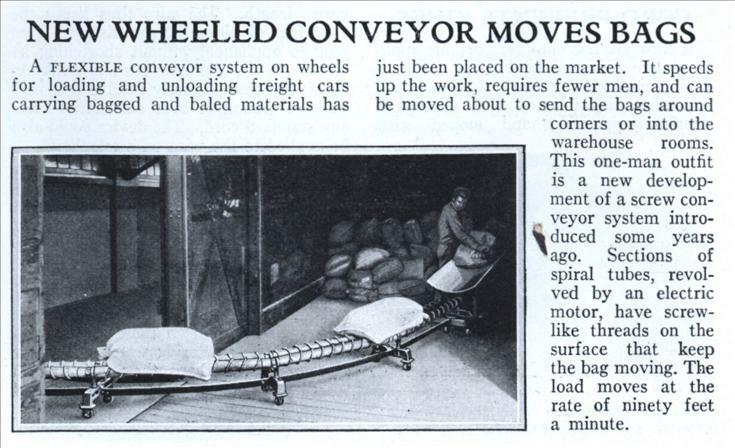 An amazingly queer yet simple invention lifts the curse of night driving from the motoring world. This altogether new discovery called "Perfect-O-Lite," replaces old glass "bulbs" in your automobile headlights with truly amazing results. Road illumination is instantly doubled yet glare is absolutely banished. Ordinary objects in the road, ruts, animals, obstructions, etc., are made clearly visible at least three times as far. Instead of ordinary "direct" light, this beam is composed entirely of double-reflected or "infused" light. This new kind of light cuts right through the other fellow's headlights. Even shoots through fog, mist, rain and snow. 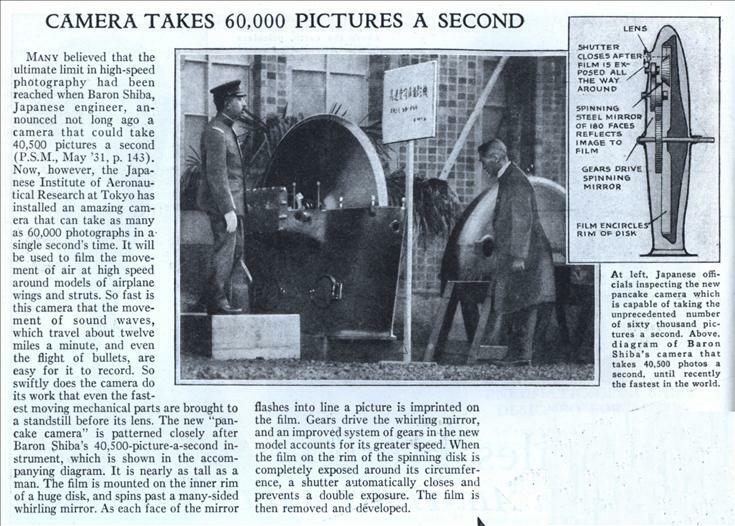 Many believed that the ultimate limit in high-speed photography had been reached when Baron Shiba, Japanese engineer, announced not long ago a camera that could take 40,500 pictures a second (P.S.M., May '31, p. 143). Now, however, the Japanese Institute of Aeronautical Research at Tokyo has installed an amazing camera that can take as many as 60,000 photographs in a single second's time. 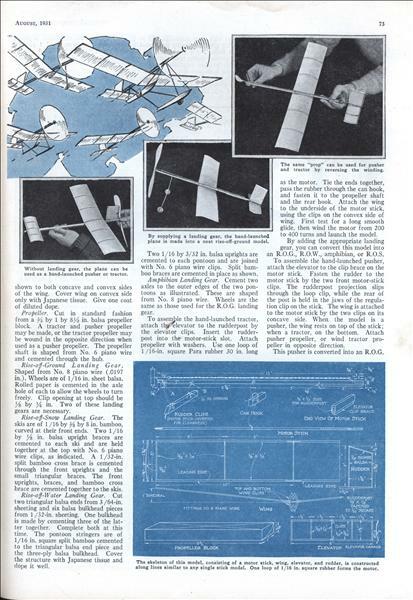 It will be used to film the movement of air at high speed around models of airplane wings and struts. 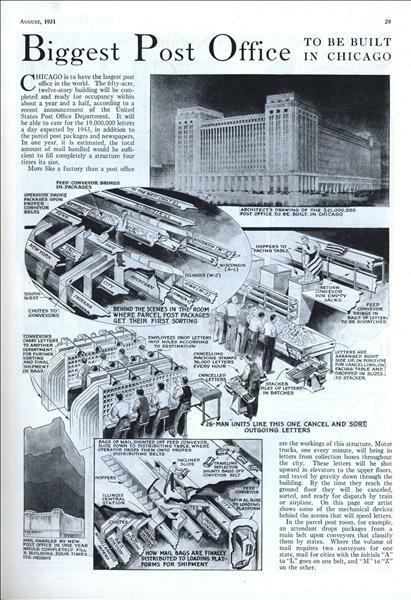 CHICAGO is to have the largest post office in the world. The fifty-acre, twelve-story building will be completed and ready for occupancy within about a year and a half, according to a recent announcement of the United States Post Office Department. It will be able to care for the 19,000.000 letters a day expected by 1943, in addition to the parcel post packages and newspapers. Has Junior a natural ear for music? Or are his piano lessons wasted effort? It's easy to find out at once, according to Prof. Harold M. Williams, of the University of Iowa Child Welfare Research Station. 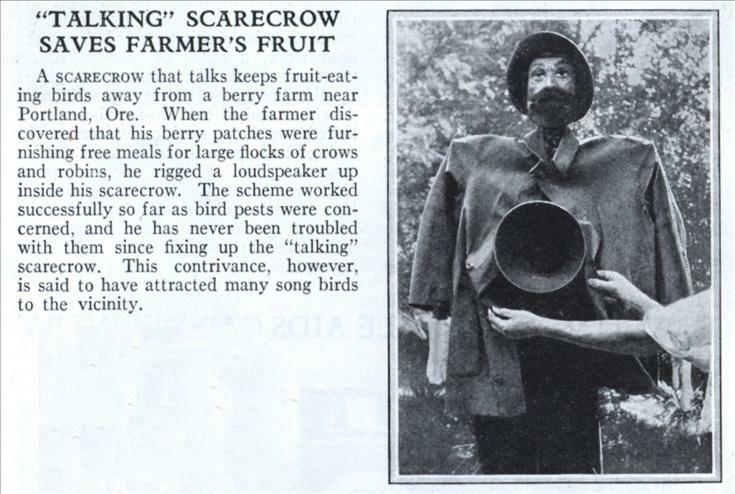 Tests he has devised show whether a child has a real sense of rhythm and whether he can keep a tune in singing.